Thank you for joining us for what turned out to be a tense, exhilarating and - let's be honest - at times stressful game. We hope you enjoyed our updates. Here's to the top flight. I couldn't resist sharing this. Yet again I am in awe of sports photographers. Isn't this a perfect shot of George Friend and Thomas Kalas captured mid celebration? This is something to see if you missed it. Middlesbrough fans running onto the pitch as they celebrate promotion to the Premier League. The consensus from Boro fans seems to be that the team need to keep Aitor Karanka in charge. Andrew Frost, from Acklam, second from right, said: "We need to keep Karanka next season. "I wouldn't say I was confident going into the game but it was a game we thought we could win and we got it in the end..
On the manager dropping Rhodes and Downing, he added: "It looked brave, a few people raised a few eyebrows, but in the end it was genius." Boro's Stewart Downing takes part in a lap of honour with his daughters. More reaction from happy Boro fans after the 1-1 draw secured promotion. Dan Robinson, from Coulby Newham, and Amy Colpitts, from Grangetown, said they were "over the moon". Dan said: "We knew how the team has performed before, but getting that buffer of a goal was really important." And on their hopes for next season? "As long as we don't come straight back down, that would be good, but it will be interesting to see who stays and who goes. "Karanka knows what, he sees more of the team than we do, Stuani scored so it's good." And one from Gary. The thought of Match of the Day must be raising a smile. BBC Tees reporters are not the only ones so happy their tweets come with exclamation marks and capital letters. A promotion that could be worth £170m does that to a person. Welcome back - enough said. It's amazing how fast footbalI fans can move. Fans are still getting over the shock of seeing Boro back in the Premier League. Andrea and David are still trying to come to terms with it. Andrea, 36, who has been a supporting them all her life, said: "My emotions are a bit up and down." "I went to Wembley last year (for the play-off final) and that was still in my head," she said. "We're the Boro, we don't do things easily but that's why we love them!" Well, we are definitely surrounded by some very happy people. Colin George is in Middlesbrough, lucky chap. If he isn't carried off in a swell of excitement he'll be letting us know what the fans think - although I think I can guess. Thank you so much for your company for the past five hours. It was every bit as tense and exciting as we all expected it to be. 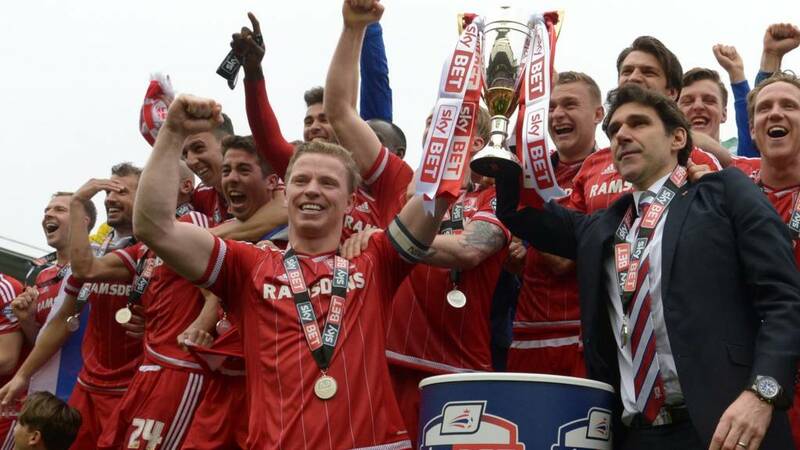 That's me done, but I'm going to hand over to my colleague Francesca Williams, who will bring you more reaction to Middlesbrough's promotion to the Premier League. Burnley wrapped up the Championship title with victory at relegated Charlton, whose head coach Jose Riga resigned shortly after full-time. Middlesbrough clinch promotion to the Premier League on goal difference after drawing with Brighton & Hove Albion. ... glad to be of service. After missing out on automatic promotion today, Brighton are now faced with the prospect of the play-offs. They'll face Sheffield Wednesday in their semi-final, while Hull will take on Derby. The final is scheduled for Saturday, 28 May at Wembley. Brighton, Hull, Derby and Sheffield Wednesday will contest the play-offs. MK Dons, Charlton and Bolton have been relegated. Meanwhile, back at the Riverside Stadium, Middlesbrough's players and coaching staff are on the field and celebrating promotion. They've just lifted the runners-up trophy and are about to do their lap of honour. Charlton had already relegated back to League One, even before today's 3-0 home defeat by champions Burnley. Riga was the Addicks' third manager of the campaign, following Guy Luzon and Karel Fraeye.